For something so simple in its basic form, bread is brilliant at bringing out the best in people. The ceremonial cutting of a freshly baked loaf tempts onlookers to gather around; community ovens in marketplaces act as social hang-out spots; most nationalities have their own traditional bread, one that generations of locals proudly pass on the recipe for. Surrey-based baker Rhiannon Abbott has witnessed the magic of bread first-hand. She runs baking courses at The Epsom Bakehouse, but as well as teaching beginners and improvers how to make their own loaves, she inadvertently provides the space for mindfulness through the physical act of breadmaking. Here we chat about Rhiannon's work, the universal love of bread and how the baking process can be therapeutic. Rhiannon, have you always been a breadlady? "I've baked all my life as it's something I really enjoy, but it's not always been my job. Having left a career in local government in 2012, I decided to try something different and signed up for a Bread Angels microbakery course. The course taught me not only more about baking great bread but also the basics of establishing a bakery from home. "Not long after, I started The Epsom Bakehouse and built a loyal following from selling delicious fresh bread at the Epsom Farmers Market. Now I pass on my skills through a range of breadmaking courses, which I started because I enjoy teaching and I like meeting a diverse range of students. I teach hands-on techniques as well as the importance of fresh bread made from simple ingredients." I've never met anyone who doesn't like bread. There's nothing like watching butter or spread melt on a freshly baked slice, then putting it in your mouth. Why do you think it's so universally likeable? "I think you've put it well there! It's the taste and the wonderfully evocative smell that makes bread so well-liked. Many people have strong memories linked to bread – for example, having it baked for them in childhood. I think this also plays a part." Sometimes, after a long day at my laptop, I love getting my hands in dough and cooking crusty ciabatta or flatbreads. Do you think other people find baking fun and relaxing too? "Once you get into bread baking, you realise that you can use simple and relatively cheap ingredients to make an almost-endless range of breads. People in my classes have commented on how the act of mixing, kneading and shaping dough can be therapeutic, a bit of time out and a chance to switch off and relax. I suppose you can't do much else when your hands are covered in sticky dough!" Where do you personally find happiness in bread? "Firstly, in the eating! My favourite bread is a malted seeded loaf, toasted and spread with homemade jam. Secondly, through my business, I've discovered a real love of teaching and passing on my skills to others. It's wonderful to hear from students who are now enjoying baking bread at home for their friends and family. "My favourite moment in a class is the 'wow' moment that happens when my students see their freshly baked loaves coming out of the oven. Baking gives people a real sense of achievement, especially when they get to see the dough rise and the transformation to crusty warm bread." Do you have any tips for people who want to make bread without a bread machine, but are either short on time or lacking in confidence? "My top tip for baking great bread is to have patience - or at least a distraction! Leave your bread dough to rise for longer than you think necessary, especially if the weather is cool. "If you're just starting out or have little time, a no-knead recipe can work well (see Rhiannon's recipe for no-knead tomato and basil focaccia). You mix the dough overnight and then shape and bake the next morning. There's very little hands-on time, though, so you don't get as stuck-in with the process." If you've never baked your own mighty loaf before, you can sign up to Rhiannon's free five-day breadmaking tips series. She's got lots of advice to give on everything from kneading to shaping and baking. 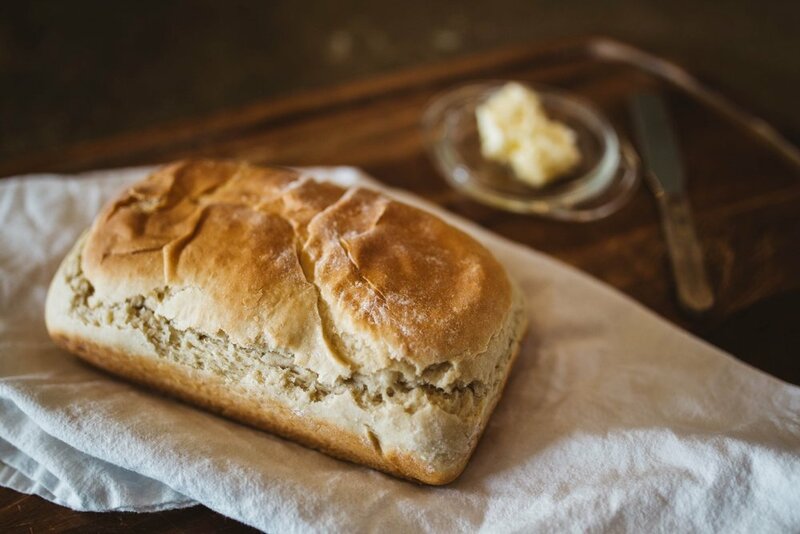 If you've got a great recipe for bread that you'd like to share, or a story about why another foodstuff is special to you, please get in touch!